During Prohibition, alcohol-based "medicines" like these were common. The most infamous of these, Jamaica Ginger, unfortunately contained a substance that was neurotoxic in addition to the alcohol, however. Wolfsbane got its name as it was used to kill (ordinary) wolves in Classical Greece. 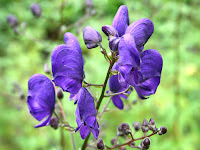 Wolfsbane was a translation of lykoktonon. 20ml of pseudaconitine (though it is a solid) would be enough to kill hundreds of adult humans by the oral route, much more if injected. Possibly they meant "mg"? The Poison Garden has a quick summary of why Nathan Greenaway almost certainly did not die from brushing against Aconitum (or mashing large quantities into his cuts). http://www.thepoisongarden.co.uk/blog2/blog250615.htm Media hysteria notwithstanding. Several people per year do die from Aconitum poisoning from its use as a medicine in China and by others using Traditional Chinese Medicine. I was going to give some forensics papers as references but you can search http://www.fsijournal.org/ and find 21 papers. The Poison Garden has a neat summary of the plant that is more accurate and comprehensive than Zitbits. Pat, thanks for the useful additional info about wolfsbane. I found The Poison Garden site when researching this article, but I went with the Zitbits site, perhaps erroneously. In any case, wolfsbane is not likely to cure a headache - and homeopathic concentrations aren't going to have any effect at all. As with all homeopathy, it's just magical thinking. Yes, I too was going to say that brushing against wolfbane, or cutting the flowering stalks for a flower arrangement, or staking up their too tall stems, virtually any normal gardening activity will not result in any harm. But please don't eat the wolfbane. Processed Aconite (Fu Zi) is a commonly used and important herb in Tradtional Chinese Medicine. Again dosage is everything.